Everyone loves a good birth story don’t they? I assume that’s why One Born Every Minute had been such a success. As much as hearing birth stories is one of my favourite things nothing quite compares to telling your own so here’s my story of how I turned around the feelings of neglect from my first birth to hypnobirthing like a boss for my second! Introverted, vulnerable, silent, low self-esteem are all words that describe me, although not the me that most people see. In fact, only a very small number of people have ever seen this version of me. This is me in labour. To anyone who knows me I’m sure that this seems highly unlikely. During my first birth, I was neglected by the midwives and if it hadn’t been for one of the health care assistants hearing me sobbing alone in a freezing cold bath, who knows how much worse it could’ve turned out. Turns out that when I’m in extreme pain I internalise it. To the outside, I looked like I wasn’t in labour and that I wasn’t in much pain, a bit of a dangerous situation when the midwives are rushed off their feet and everyone else is shouting louder and kicking up more fuss! Inside I was a wreck, I was even hallucinating (no drugs btw!). I was sure I didn’t want an epidural or a C-section ( I really didn’t want to have a catheter of all the things to worry about!). Prior to my birth, I was loaned a hypnobirthing CD and if I’m honest I didn’t hold out much hope that it would make a difference. I’m not really one for all that Dippy Hippy stuff! When I had my baby I was relieved it was over, I felt that I had been robbed of the water birth that I had planned and I felt neglected. 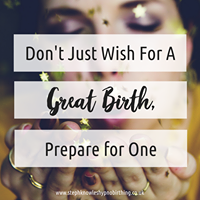 Apart from the fact that I couldn’t understand why on earth anyone would give birth more than once, I knew that if birthing was that bad with hypnobirthing there was no way I was ever going to do it again without it! Yes, it took me that long to consider getting pregnant again! I met Steph from Blossom Hypnobirthing quite early on in my second pregnancy. I was genuinely interested in her work. She was also pregnant, which was cool although I did question how she could do her job having not ever given birth herself. (Spoiler alert: I was soooo wrong!). A few months went by, we knew we were having another girl, so we had pretty much everything we needed for baby number two. I really wanted to do hypnobirthing so I arranged to do Steph’s one to one programme. Being a very internal person during birth to the extent that I can’t stand to open my eyes or have anyone talking, I decided to do the sessions alone although lots of women do them with their birth partner. I was anxious about the risk of tearing again and repeating the whole negative experience of my first birth. As a second-time mum Steph’s sessions gave me so many things, I was able to make PEACE with my first birth and see the POSITIVES. I felt EMPOWERED to know my own body and discuss my wants and needs with medical staff. I had time away from my busy life to RELAX and be mindful. The relaxations really helped me to stop and take a break from the world, turn my phone off and focus on my baby without everyday life taking over. Steph has an amazing breadth and depth of knowledge regarding BIRTH RIGHTS, choices, the physiology of birth and the psychological influences that affect your birthing experience. I looked forward to each session. I was also given a pack and a book, I read all of it and took away from it things that particularly resonated with me. My waters were broken at 4:30am on Sunday morning. I was excited, laughing and joking with the midwives having contractions but nothing severe. By 6:30am nothing much was happening so I was hooked up to the Synctocin drip, this is a synthetic form of the hormone oxytocin which makes your uterus contract. At about 8am the contractions were causing me some discomfort so I asked for gas and air. I’m not really sure on what happened after that as I was fully in the zone, not talking much and eyes closed. I do know that my daughter was born at 9:44am about an hour and 45mins after starting the gas and air. Hypnobirthing isn’t about a pain-free birth, trust me it still hurts! It’s about setting yourself up with the tools to get through the birth calmly and with some control over what happens to your body and your baby. My second birth was so much more positive than my first but when I look back on it they were remarkably similar, the main difference being my attitude and outlook. That and I had a lovely pair of midwives; the midwife that was there most of the time was a third-year student midwife. My family is now complete, mostly because I’m horrid and miserable when I’m pregnant! Birth no longer scares me, if I could give birth and get a baby without having to carry it around for 9months I’d have loads of kids! Although there’s no plan to have any more, if things didn’t go to plan, there’s no way I would give birth again without Steph’s support. Reading about birth and your options is a great way to prepare yourself mentally for birth, but the most important thing to remember is that their story isn’t your story and that you have far more control over your birth than you realise! Steph can help you to understand your birthrights, the physical and psychological implications of birth and build your confidence. She now even has her mummy badge of honour! In addition to her one to one sessions, Steph also runs small group sessions. Her next one starts on 16th April and runs for three weeks (16th, 23rd and 30th April) at the Glasshoughton Centre, Leeds Road, Glasshoughton Wf10 4PF. The cost is £195 per couple a small price to pay to ensure your child comes into a calm confident world and not one full of stress and anxiety. The physical and psychological effects of stress and anxiety are well documented in adults and children, your stress and anxiety can have a negative impact on your unborn child too.